There is no change in income tax basic exemption limits. However — The old ‘Education Cess’ and ‘Secondary and Higher Education Cess’ totalling @3% has been replaced by ‘Health and Education Cess’ @4% of income tax. It will also be levied on surcharge @12% wherever applicable. It is claimed that this extra tax is applicable only on rich and superrich. This is strictly not true. Unfortunately, this surcharge of 12% along with the cess of 4% is also applicable to DDT and taxable capital gains even for those under the tax threshold of ₹ 2.5 lakh. The following Table gives the effective tax rates payable after application of cess and surcharge under various Sections of ITA. Consequently, the exchequer is slated to get more revenue from the poor you and me in terms of surcharge and cess applicable on income under the above-mentioned Sections rather than the super rich. ITR-1 is the simplest form to be filed by an individual taxpayer who earns income from salary/pension, from one house property and income from other sources. The total annual taxable income should not exceed ₹ 50 lakh and it should not include any income from betting, gambling, etc. Unlike last year, detailed calculation of income from salary and from house property is required to be submitted. Additional fields for TDS as per Form 26QC made on rent and quoting of PAN of the tenant for such rent has also been provided. ITR-1 has been withdrawn for NRIs. ITR-2 or ITR-3 is applicable to them. A person of this category who files income tax return for the first time would not be subjected to any scrutiny in the first year unless there is specific information available with the Department. Good! This will surely attract many otherwise hesitant entities to enter the tax net. ITR-2 is applicable for individuals and HUFs having income other than income from ‘Profits and gains from business or profession’. ITR-3 is for individuals and HUFs having income under the head ‘Profits and Gains from Business or Profession’. An individual or an HUF, who is a partner in a firm, shall be required to file Form ITR-3 only and not in ITR-2. A field relating to Sec. 115H has been added relating to benefits availed under continuation of special provisions u/s 115C to 115I related with NRIs who have returned to India permanently. ITR-V: To be used by all taxpayers. This is the acknowledgment form to be submitted also with your returns. Where the ITR is transmitted electronically without digital signature you have to post it separately to CPC at Bangaluru within 120 days. Where the ITR is filed physically, you have to submit it along with the relevant ITR. Your returns will not be considered as filed unless the signed ITR-V reaches the CPC. The Department has started linking Aadhaar with PAN thereby eliminating the procedure of sending ITR-V to the Centralised Processing Unit in Bangalore. The new ITR Forms requires to report each capital gain exemption separately u/ss 54, 54B, 54EC, 54EE, 54F, 54GB and 115F. Further, the date of transfer of original capital asset is required to be mentioned. In the case of capital gain arising on transfer of unquoted shares, it would now be mandatory for the investors to obtain the Fair Market Value report as determined by a Merchant Banker or CA. These new ITR forms require reporting CGST, SGST, IGST and UTGST paid by, or refunded to the assessee. Furnishing details of cash deposit for specified period has been done away with. All these forms have been designed as annexure-less to make them amenable for electronic filing and processing. All the tax returns have to be filed electronically. However, a very senior citizen requiring to file ITR-1 or ITR-4 can file paper returns, if he so desires. Finally, until last year, if a taxpayer failed to file the ITR before end of the AY, penalty u/s 271F could be imposed only after initiating the penalty proceedings. After omission of this penalty provision by the FA17, late fee is levied u/s 234F along with interest u/ss 234A, 234B and 234C before filing the ITR. At present, u/s 143(1) the total income or loss is computed after making the adjustments specified in sub-clauses (i) to (vi) thereof. Sub-clause (vi) provides for adjustment in respect of addition of income appearing between Form 26AS and Form 16/16A which has not been included in computing the total income in the return. A new third provision has been inserted to provide that no addition of income shall be made where there is a mismatch between Form 16/16A and Form 26AS, whether that income is included in computing the total income or not while processing of return of income made u/s 139, or in response to a notice 142(1a). A new Sec. 143(3A) has been inserted whereby the Central Government will insert a new Scrutiny Scheme to impart greater efficiency, transparency and accountability through elimination of direct interface, optimal utilization of resources and introduction of team-based assessment with dynamic jurisdiction. The Government has reserved the right to direct any exception, modification or adaptation in the present Scrutiny scheme up to 31.3.2020 through new Sec. 143(3B). Incidentally, good news for senior citizens. As per a press release dt 14.03.11, the Department has decided not to take up any returns for scrutiny in the case of all the senior citizens and also those whose gross total income is less than ₹ 10 lakh. U/s 10 (12A) an employee contributing to the NPS is allowed an exemption in respect of 40% of the total amount payable to him on closure of his account or on his opting out. This exemption is not available to non-employee subscribers. This Section has been amended to extend this tax-free benefit to all subscribers. A new Sec. 56(2xi) has been inserted to provide that any compensation or other payment due to or received by any person, in connection with the termination or modification of the terms and conditions relating of his employment or business contract shall be chargeable to tax under ‘Income from other sources’. U/s 115JC where in the case of a person, other than a company, the regular tax payable is less than the AMT, the adjusted total income shall be deemed to the total income of that person and the assessee shall be liable to tax on such total income @18.5%. The recent FA18 has amended this Section to provide that for an assessee located in an International Financial Service Centre deriving its income solely in convertible forex, the rate of tax shall be 9% at par with Minimum Alternate Tax (MAT) applicable for corporate entities. A new Sec. 112A has been introduced to withdraw the exemption u/s 10(38) and to tax LTCG on equity share in a company or a unit of an equity oriented MF or a unit of a business trust @10% if STT has been paid on both acquisition and transfer. The requirement of STT being paid at the time of acquisition shall not apply to purchases made before 1.4.2004 when STT was introduced and some additional notified transactions. The tax of 10% is applicable only on amount of capital gain exceeding ₹ 1 lakh. the full value of consideration received or accruing on the transfer of such asset. The LTCG will be computed without giving effect to the 1st proviso to Sec. 48 dealing with cost inflation indexation and also the 2nd proviso dealing with foreign currency in the case of NRIs. A new Sec. 43AA has been inserted to provide that any gain or loss on a transaction arising from any change in forex rates shall be treated as income (or loss). Such transactions include those relating to monetary/non-monetary or translation of financial statements of foreign operations or forward exchange contracts or forex translation reserves. in a case where the capital asset is listed on any recognised stock exchange, the highest price of the capital asset quoted on such exchange on 31.1. 2018. Where there is no trading in such asset on that date, the FMV shall be its highest price on a date immediately preceding date when it was traded. in a case where the capital asset is a unit not listed on recognised stock exchange, its NAV on 31.1.2018. The benefit of deduction under chapter VI-A as well as the rebate u/s 87A and also the exemption u/s 54EC is not available on such capital gains. However, gains arising from a transaction on a recognized stock exchange in any International Financial Services Centre and where the consideration is received or receivable in Forex, shall be eligible under this Section without payment of STT. Sec. 115D has been amended to make all these changes applicable to FIIs, consequent to deletion of Sec. 10(38). Indexation of cost for unlisted shares has been made possible. The way it will work is that LTCG on any sale of investments made before 1st of February, 2018 will be split into two. The capital gain earned till 31st of January, 2018 will be exempted from tax. The rest of the gains (from 31st January till date of sale) will attract tax at the flat rate of 10% without indexation. If the sale price is lower than the cost as on 31st of January, 2018, then in effect, there would be no capital gain. The following table details the various scenarios that may emerge. In Scenario I, since the result would be a long-term loss, this loss should be available for set-off against other taxable long-term gain. The point hasn't been highlighted in the general media. Also it needs to be noted that this tax just cannot be saved i.e. there is no provision / deduction available that offers a deduction / exemption from this new long-term tax. Even Sec. 54EC bonds (as explained further on) cannot be used. Also, so far as investment decisions are concerned, please note that nothing changes. The reason for this is two fold. Firstly, the tax (as you can see from the table) is applicable basically only to the difference between sale value and the cost as on 31st of January. So almost all the capital gain would be exempted in any case. W.e.f. 1.10.04, STT has been slapped on all purchase and sale transactions of shares in a recognised stock exchange in India in securities and also sale or redemption transactions in units of equity-based MF schemes, irrespective of whether the purchaser or seller is a taxpayer or not and also whether the transaction entails a capital gain or loss. The intention of bringing in STT was counterbalance the loss in revenue arising out of making LTCG exempt u/s 10(38). The ‘give’ is in terms of making the LTCG exempt u/s 10(38) and STCG exigible to tax at the concessional rate of 15 u/s 111A. F18 has retained the STT slapped capital gains tax on such transactions. The new LTCG regime is related with Equity Shares listed on a recognised stock exchange in India, Units of an Equity-oriented Fund of an MF or Units of a Business Trust. For acquiring long-term status, there is no change in the current requirement of the holding period of 1 year and payment of STT both at the time of sale and purchase (except in the case of purchases made before 1.4.04 when STT was introduced). The change as such has taken place in the definition of cost of acquisition. To begin with, it will be the actual cost at the time of its purchase, as is the normal convention. Now come complications, starting with definition of Fair Market Value (FMV) --- In case of a listed equity shares or an unit, the FMV means the highest price of such share or unit quoted on the exchange on 31.1.18 and if there was no trading on this date, immediately preceding this date on which it was traded. Then comes the definition of ‘cost of acquisition’ --- If the actual cost is less than the FMV, the FMV will be deemed to be the cost of acquisition. However, if the full value of consideration on transfer (sale value) is less than the FMV, then such full value of consideration or the actual cost, whichever is higher, will be deemed to be the cost of acquisition. In the case of unlisted unit, the net asset value of such unit on 31.1.18 will be the fair market value. The holding period will be counted from the date of acquisition. There will be no TDS to a resident tax payer. Tax @10% will be deducted from payment of long-term capital gains to a non-resident tax payer. FIIs will be on par with resident tax payers. The tax payable is @10% on such LTCG, so computed (without indexation of the cost of acquisition) exceeding ₹ 1 lakh. STCG will be continued to be taxed @ 15%. LTCG will be taxed lower @10%. The method of calculating the gain is identical for ST and LT. Also, if the normal income (without LT gains) of a Resident individual or HUF, happens to be below the tax threshold applicable to the person, then, the LTCG shall be reduced by the amount by which the normal income falls short of the tax threshold. Moreover, the rebate u/s 87A shall be allowed on the income-tax on the total income as reduced by tax payable on such capital gains. Long-term capital loss arising from transfer made on or after 1.4.18 will be allowed to be set-off and carried forward in accordance with existing provisions of the Act. Therefore, it can be set-off against any other LTCG and unabsorbed loss can be carried forward to subsequent 8 years for set-off against long-term capital gains. This is possibly a boon in some cases. For instance, say Ramesh had bought some shares of Jaiprakash Associates (JP) on 30.6.09 for ₹ 204.02 and its value now has crashed down at ₹ 17.60. Earlier, since the gains were tax-free, the losses were also tax-free. So the entire loss was wasted - nothing could be done about it. However, now, the same is available for set-off against other long-term gains. Valuation of bonus shares is another area where investors would be benefited. The cost of acquisition of bonus shares acquired before 31.1.18 is not longer required to be taken at nil value. For example, the same Ramesh, on account of his holding had received a 1:2 bonus on 18th of January, 2010. Earlier, he would have to take the cost of these bonus shares as nil. However, now he can adopt the value of JP as on 31.1.2018 as his cost. At present, while taxing capital gains u/s 50C, business profits u/s 43CA and gifts u/s 56(2x) arising out of transactions in land or building or both, the sale consideration or stamp duty value, whichever is higher is adopted. The difference is taxed as income both in the hands of the purchaser and the seller. FA18 has declared that no adjustments shall be made in a case where the stamp duty is higher than the sale consideration by not more than 5%. Sec. 45 provides that capital gains arising from a conversion of capital asset into stock-in-trade shall be chargeable to tax. 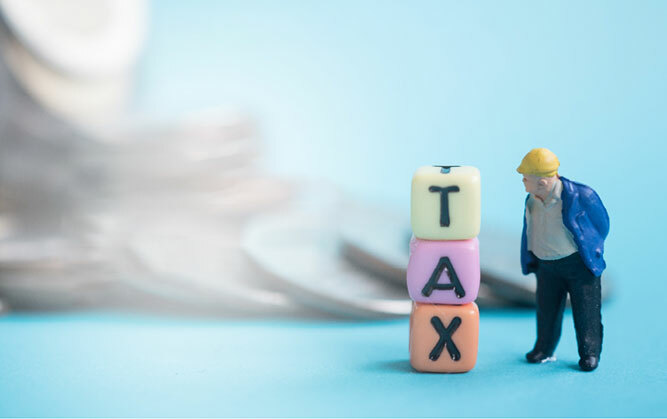 However, in cases where the stock-in-trade is converted into, or treated as capital asset, the existing law does not provide for its taxability. Sec. 28(via) has been inserted to provide that any profit or gains arising from conversion of inventory into capital asset or its treatment as capital asset shall be charged to tax as business income. The FMV of the inventory on the date of conversion or treatment determined in the prescribed manner, shall be deemed to be the full value of the consideration received or accruing as a result of such conversion or treatment. Consequential changes have been effected in Sec. 2(24), Sec. 2(42A) and Sec. 49. The exemption has been restricted only to LTCG arising from land or building or both. In other words, Sec. 54EC cannot be used anymore for LTCG arising from shares and securities, Bonds, precious metals and ornaments, archaeological collections, drawings, paintings, sculptures, any work of art, stock-in-trade, etc. Moreover, this exemption is no more available for LTCG arising out of Sec. 54F on any asset other than land. The lock-in period of such Bonds has been increased from 3 years to 5 years. There were five basic inherent problems associated with these bonds. And these problems as listed hereunder continue to exist even after the new regime as envisaged by the recent Budget. Firstly, the interest rate, which is abysmally low. An investment in these bonds comes with a give and take. The give is the exemption and the take is the low interest rate fully taxable, payable annually. This rate has been brought down from 6.00% to 5.25% w.e.f. 1.12.16. Thankfully, there is no TDS. The face value of the Bonds is ₹ 10,000. Suppose you have earned a capital gain of ₹ 3,000. You cannot buy Bonds worth ₹ 3,000. You have two choices --- i) Buy the Bond worth ₹ 10,000 to save the tax on LTCG of ₹ 3,000. The extra ₹ 7,000 earns the lower interest rate of ₹ 5.25% but does not save any more tax. or ii) Pay tax on ₹ 3,000 @20.8% flat and invest rest of the amount earning market rate of interest from an equally safe source which is higher. Which choice should a taxpayer opt for? Basically should one invest in the bonds and save tax or pay the tax and invest the post-tax proceeds in greener pastures? We shall answer this query a little later. The investment can be made within the stipulated period of 6 months. Now suppose the assessee has incurred capital gains during February/March. The period of 6 months within which the Bonds have to be purchased falls in August/September. However, he has to file his tax returns on or before 31st July. What is to be done? We have no answer to this problem. Irrespective of the date on which you make the payment, the deemed date of allotment is the last day of the month during which the application amount has been cleared. The period of 6 months from the date of transfer of the original asset will end on this date and not the date when you have actually made the investment. Ditto for the lock-in period of 5 years (earlier, before the Budget, it was 3 years). Take care. The bonds are non-transferable, non-negotiable and cannot be offered as a security for any loan or advance. Issued by institutions with such high pedigree and with a lock-in of five years, the least the authorities could have done is to make the bonds eligible as security for bank loans. The exemption would be available only in respect of LTCG earned from immovable property and not from any other asset. In other words, Sec. 54EC cannot be used anymore for LTCG arising from securities, bonds, precious metals, ornaments, paintings, sculptures etc., and most importantly shares. The lock-in period that was 3 years has been now increased to 5 years. In other words, the assessee is forced to accept the lower rate of 5.25%, fully taxable, for an extended period of two more years. The long term capital gain is a round figure of ₹ 10,000. You are in the highest tax bracket of 31.2% (30%+cess of 4%). The market rate of interest from an equally safe source is 13.01%, fully taxable. Why such an odd figure? Please bear with us and read on. If you decide to pay tax on CG (flat rate of 20.8% irrespective of your tax zone), the tax payable is ₹ 2,080 and your take home CG is ₹ 7,920. This is the amount you can deposit in a 5-year FD @ 13.01% taxable. The after-tax take home interest rate works out at 8.95%. The maturity value of ₹ 7,920 invested @8.95% works out at ₹ 12159.65 (= 7920*(1.0895^5). = 361.20 x 5.9787 = 2,159.65. The take-home after 5 years in both the cases is the same. In other words the Break-Even Rate (BER) i.e., the rate of return where you would be agnostic between buying the bonds or investing the after tax proceeds for the 31.2% tax-zone is 13.01% p.a. It is found that the BER for 20.8% zone is 12.11% p.a. and that for 10.4% zone is 11.41% p.a. If the math looks complicated, please ignore it. The net takeaway is the following --- Assuming you are in the 31.2% tax bracket, if you can earn a rate of return in excess of 13.01% p.a. from the post tax proceeds, then you are better off paying the tax. If not, you are better off buying the bonds. Note however that this is for round figures of capital gains in multiples of ₹ 10,000. For any other odd value of gains, the BER would change accordingly. For example, in the 31.2% tax bracket, if say the LTCG was ₹ 5,13,000 - then for ₹ 5,10,000, the BER is 13.01% p.a. as mentioned - but for the additional ₹ 3,000, the BER works out to be 7.35% p.a. Therefore, one would invest ₹ 5,10,000 in the bonds and ₹ 3,000 in say RBI bonds where the rate is higher at 7.75% p.a. The relevant rates for the 20.8% and the 10.4% tax brackets are 7.10% p.a. and 6.61% p.a. respectively. Lastly, the only avenue where returns could be higher than the above mentioned BER would be the stock market. So those who have a good risk appetite and do believe that the Indian stock market, thanks to the many reform measures undertaken by the government, is slated to rise at a steady rate, may consider going in for equity-based schemes of MFs instead of the bonds. Else, investing in the bonds is like saving tax and getting paid for it! New Sec. 47(viiaab) has been inserted to provide that any transfer of a Bond or GDR referred to in Sec. 115C(1) or rupee denominated bond of an Indian company or derivative, made by an NRI on a recognised stock exchange located in any International Financial Service Centre and where the consideration is paid or payable in forex, shall not be regarded as transfer. Sec. 115R which levied no tax on dividends received from an open-ended equity-based MF scheme has been amended to provide for DDT @10%. Deemed dividend u/s 2(22e) shall be subject to dividend distribution tax @30% without grossing up. As per Explanation u/s 80D(5) a senior citizen is an individual Resident in India who is of the age of 60 years or more at any time during the relevant previous year. For very senior citizens the age is 80 years. In the case of Prabhu Dayal Sesma v State of Rajasthan & Another, 1986AIR1948 it was observed, “At first impression it may seem that a person born on 2 January, 1956 would attain 28 years of age only on 2 January, 1984. But that is not quite accurate. In calculating a person’s age, the day of his birth must be counted as a whole day and he attains the specified age on the day preceding the anniversary of his birthday.” CBDT Circular 28/16 dt 27.7.16 has accepted this verdict. Consequently, a person born on 1st April would be considered to have attained a particular age on 31st March. The distinction between senior and very senior citizen appears to have been dropped by FA18 for the purpose of granting concessions but not for tax rates. The deduction provided by Sec. 80D, towards annual premium on health insurance policy, or preventive health check-up or medical expenditure of a senior citizen has been raised from ₹ 30,000 to ₹ 50,000. In the case of single premium health insurance policies having cover of more than one year, the deduction shall be allowed on proportionate basis for the number of years for which health insurance cover is provided, subject to the specified monetary limit. The deduction available u/s 80DDB available to an individual and HUF with regard to amount paid for medical treatment of specified diseases in respect of very senior citizen up to ₹ 80,000 and in case of senior citizens up to ₹ 60,000 subject to specified conditions. This deduction has been thankfully raised to ₹ 100,000 for both. A new Sec. 80TTB has been inserted to allow a deduction up to ₹ 50,000 on interest from deposits held by all senior citizens (but not HUFs and Partnership Firms) from a banking company or institution, co-operative society engaged in the business of banking, and Post Office. Consequently, the deduction u/s 80TTA of ₹ 10,000 shall be available only to non-senior citizens and HUFs. Sec. 194A has also been amended to raise the threshold for TDS on such income for seniors to ₹ 50,000. A new Sec. 16(ia) has been inserted to allow a standard deduction up to ₹ 40,000 or the amount of salary received, whichever is less. Simultaneously, the current exemption available u/s 17(2viii) in respect of medical reimbursement of up to ₹ 15,000 p.a., and Transport Allowance u/s 10(14ii) of ₹ 19,200 p.a., stands withdrawn. This means that the effective benefit is essentially only ₹ 5,800. Of course, to those who didn’t get the TA or medical reimbursement, the change would be significant – but means little for others. Thankfully, the transport allowance in the case of handicapped employees for whom the allowance was higher at ₹ 38,400 p.a., shall continue. The benefit of standard deduction shall also be applicable to pensioners who normally are not eligible to any allowance on account of transport and medical expenses. A flat Standard Deduction of ₹ 40,000 has been introduced in respect of salaries. However, the ₹ 15,000 medical reimbursement and ₹ 19,200 (Rs. 1,600 per month) of exempted Transport Allowance would no longer be applicable. So essentially, the net difference is of only ₹ 5,800. Of course, to those who didn’t get the TA or medical reimbursement, the change would be significant – but means little for others. Sec. 56(2xi) has been inserted so as to provide that any compensation or other payment due to or received by any person, in connection with the termination or modification of the terms and conditions relating of his employment or business contract shall be chargeable to tax under ‘Income from other sources’. At present, u/s 43(5e), transactions in commodity derivatives on a recognised stock exchange in India are not treated as speculative only if CTT has been paid. A new proviso has been inserted after this Section by the recent FA18 to provide that trading in agricultural commodity derivatives on such an exchange shall not be considered as a speculative transaction even if it is not chargeable to CTT. In order to align the definition of ‘taxable commodities transaction’ with instruments allowed for transaction in commodity derivatives, Sec 116(7) has been amended by the recent FA18 so as to include ‘options in commodity futures’ in this definition. As per the existing provisions, the rate at which a commodities transaction tax in respect of every commodities transaction, being sale of commodity derivative shall be chargeable and such tax shall be payable by the seller. Sec. 117 has been amended to prescribe the rate at which sale of an option on commodity derivative shall be chargeable and such tax shall be payable by the seller. Further, the rate at which sale of an option on commodity derivative, where option is exercised, shall be chargeable and such tax shall be payable by the purchaser. Sec. 118 has been amended so as to include the value of taxable commodities transaction, being option on commodities. It has now become necessary u/s 139A, for even a non-individual entity to have a PAN if it enters into a financial transaction/s aggregating to ₹ 2.5 lakh or more in an FY. Such entities cover managing director, director, partner, trustee, author, founder, Karta of HUF, CEO, principal officer, or office bearer of such persons. FA17 has introduced a new Sec. 139AA requiring every person eligible to obtain Aadhaar shall, on or after 1.7.17, quote it in the return of income furnished by him. Circular 6-1/2016-UIDAI (DBT) dt 15.11.17 draws attention to Sec. 2(v) of the Aadhaar Act which defines ‘resident’ as an individual who has resided in India for a period of periods amounting in all to 182 days or more in the 12 months immediately preceding the date of application for enrolment. This definition is entirely different from that as defined either by ITA or FEMA. However, in a recent circular issued by UIDAI, it is clarified that NRIs /PIOs/OCIs are exempt from obtaining an Aadhar number. Yes, they can, if they choose to do so apply for it and obtain a card when they are physically present in India. FA17 has widened the scope of taxability to gifts to companies, firms etc. However, this provision will not apply to money or property received from an individual by a trust created or established solely for the benefit of a relative of the individual. Last year a penalty of ₹ 10,0000 was imposed on Accountant u/s 271J levied by assessing officer or CIT(Appeals) for giving certificates containing incorrect information. This penalty was not appealable. Section 253(a) has been amended to make an order passed by a Commissioner (Appeals) appealable to the Appellate Tribunal. Unfortunately, it appears that there is no corresponding amendment u/s 246A for penalty levied by Assessing Officer. Notifications GSR 586(E) dt 25.7.03 prohibits NRIs and GSR 291(E) dt 13.5.05 prohibits HUFs, AOPs and BOIs from opening a PPF account or opting for its post-maturity continuation. Such accounts opened or continued by mistake after the respective dates of notifications shall be treated as void ab initio. As and when the error comes to light, the account shall be closed and the amount refunded to the depositor without any interest. The existing accounts can continue up to their maturity with full benefits. Additionally, Notification GSR 956(E), dt 7.12.10 requires those HUF accounts which are in the extended mode to be closed on or before 31.3.11. Interest would be paid on those accounts, which had attained the maturity between 13.5.05 to 7.12.10 but closed before 7.12.10. Recently the authorities had issued a notification declaring that even those accounts of NRIs which have not reached normal maturity will be ‘deemed to have been closed’ and simple interest of POSB rate (4% p.a.) will be paid until the account is actually closed. Fortunately, this notification stands withdrawn. If you desire to continue to enjoy the benefit of PPF for your HUF, you can legally play a trick. Sec. 80C(4) continues to allow the deduction for LIC premiums and subscription to PPF, ULIP of UTI and Dhanaraksha of LICMF by HUF in the name of any member of HUF. Therefore, you can open a PPF account in the name of an HUF member not having a PPF in own name, even a female, and contribute to it through the HUF bank account to avail the 80C benefit to HUF. As per Sec. 9 of PPF Act, a PPF account shall not be liable to attachment under any decree or order of any court in respect of any debt or liability incurred by the subscriber. However, income tax authorities can attach PPF accounts to recover tax dues — MoF DEA letter 7/21/88-NS.II dt 10.8.90. The recent FA18 has negated this judicial pronouncement by declaring that it cannot be attached under any law to recover any debt or liabilty of the depositor. Incidentally, allow us to point out that PPF is no more attractive with its tax-free interest rate of 7.6%. The returns from ELSS of MFs have reached an average rate of 14% and it gives the same tax benefits.